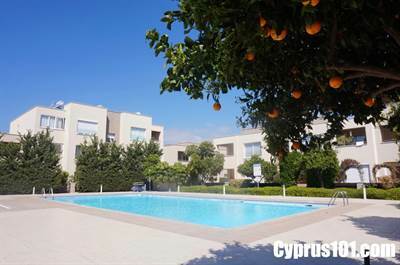 This perfectly presented two bedroom, ground floor apartment is located on a secure gated complex in the traditional Cypriot village of Mandria, approximately 15 minutes’ drive from Paphos and 25 minutes from Limassol. Mandria has a good variety of local amenities including restaurants and tavernas. From the property it’s an easy stroll to the local beach and the area is very popular for walkers and cyclists who use the many popular rural paths. The apartment is light and spacious with stylish, quality finishes throughout. The accommodation features an open plan living room with cosy lounge, formal dining area and fully fitted corner kitchen, nicely separated from the living space by a useful breakfast bar. A hallway leads from the living room to the master and second bedroom, both of which have elegantly finished dark wood fitted wardrobes. The master benefits from an en-suite shower room and directly off the hallway is a fresh contemporary style family bathroom. There is easy direct access via sliding patio doors from both the lounge and kitchen to a good size covered veranda and a fitted sun blind makes this leisure space ideal for use in both the summer and winter months. Being a ground floor apartment, the property also benefits from a private, low maintenance garden with plenty of space for relaxing and enjoying the wonderful sunshine. The complex is very well maintained and facilities include landscaped gardens filled with colourful flowering shrubs, lining the pathways to a super large swimming pool, surrounding sunbathing terrace and separate children’s paddling pool. The property is perfect as a permanent residence or holiday home and has lots to offer those wanting a quiet village location within walking distance to the beach and local amenities. It comes fully furnished, “ready to move in” and title deeds are available.